TableTextCompare - Compare csv/tab-delimited text files. CSVFileView cannot load extremely large csv files. Added .tsv extension (Tab Separated Values) to the open dialog-box. Replaced the font on the properties window to ensure it can display all characters. Fixed bug: CSVFileView failed to display properly csv lines with very long field. Added 'Always Use Advanced Open Settings' option (Under the Options menu). When it's turned on, CSVFileView will open all files according to the last settings you choose in the 'Advanced Open' window. Added 'Align Numeric Columns To Right' option (Under the Options menu). Added 'Quick Filter' feature (View -> Use Quick Filter or Ctrl+Q). When it's turned on, you can type a string in the text-box added under the toolbar and CSVFileView will instantly filter the csv table, showing only lines that contain the string you typed. Fixed bug: CSVFileView crashed when using the find option while the last item was selected. Fixed the filter text-box to handle Ctrl+A (Select All). Added 'Auto Detect Remark Lines' option. When it's turned on, CSVFileView tries to detect and skip the first remark lines in a file. Added 'New CSVFileView Instance' under the File menu, for opening a new window of CSVFileView. Fixed bug: CSVFileView displayed wrong items when opening a file with a filter turned on. Fixed bug: CSVFileView failed to load properly a filter string from the .cfg file that had single quote in the first and last characters. Fixed bug: 'Auto Size Columns' option was disabled immediately after loading a file. Reduced the memory footprint while loading UTF8 or Ascii file. Added </tr> </td> closing tags to the HTML files. Added 'Load Filter' option to the 'Advanced Open' window. It's similar to the 'Display Filter' feature, but instead of filtering the file after it's already loaded , the load filter skip items during the loading process, so the file will be loaded faster and CSVFileView will consume less memory. Added 'First line contains column names' and 'Automatically detect the delimiter and quotes characters' options to the 'Advanced Open' window. Added /aload command-line option, for loading a file according to the 'Advanced Open' settings. CSVFileView now displays an error message in the status bar when it fails to open a file. Added 'Enable String Interning' option. When it's turned on, CSVFileView tries to detect repeating column values, and store them in memory only once, instead of multiple times. This option can be useful if you load a large file with many repeating strings, because the memory consumption of CSVFileView will decrease dramatically. However, the loading process will be slower than normal. Fixed issue: When loading a large file, some actions, like selecting items and copying selected items to the clipboard were very slow. Added 'Add Byte Order Mark To Unicode Files' option. If you turn it off, CSVFileView won't add Byte Order Mark (BOM) when saving to Unicode file. Fixed bug: CSVFileView failed to remember the last size/position of the main window if it was not located in the primary monitor. Added 'Keep Columns Size/Order on Refresh' option. Added 'Copy Sorted Column Data' option, which copies to the clipboard the text of all selected items, but only the column that is currently sorted. Added 'Select All' and 'Deselect All' options in the 'Choose Columns' window. Added option to specify space character ( /s ) as delimiter in the 'Advanced Open' window. Added 'Original File Order - Descending' and 'First Column - Descending' to the 'After Loading File - Sort By' option. While loading large files, CSVFileView now displays progress information in the status bar. CSVFileView now loads large files much faster and with less memory usage ( /FastMode command-line option is not needed anymore. If from some reason you want to run it in the previous mode, you can execute CSVFileView with /NoFastMode command-line option). Fixed bug: When 'Auto Refresh' option was turned on, trying to load a large csv file caused CSVFileView to hang and to consume extreme amount of memory. Added option to display the csv lines with different font (Options -> Select Another Font). Added 'Scroll To Bottom On New Line' option. If this option is turned on, a parial refresh is made, and new lines were added since the last refresh, then the List-View is scrolled to the bottom in order to show you the added new lines. Added 'Partial Refresh' option (Ctrl+F5), which makes a smooth refresh, without reloading the entire table. However, Partial Refresh will not work properly if you add/remove columns or change their position. Added 'Auto Refresh Mode' which allows you to choose how to refresh when the 'Auto Refresh' option is turned on - Partial Refresh or Full refresh. Fixed bug: CSVFileView crashed when opening a file with large amount of columns. The properties window now supports multiple pages, for handling files with large amount of columns. Fixed bug: When opening a file with /load command-line option, CSVFileView sorted the list by the first column, even if the 'Sort by original file order' option was selected. Fixed issue: If you open a file with 'Advanced Open' window and then do a refresh (F5) CSVFileView now loads the file with the last 'Advanced Open' settings. In previous versions, it opened the file with the default settings. Added 'Open Text In Clipboard' option (Ctrl+F7), which allows you to open csv/tab-delimited text that you copied to the clipboard. You can also specify 'Clipboard:' as a filename in the 'Advanced Open' window or from command-line (/Load Clipboard:) , in order to grab the csv/tab-delimited text from the clipboard. Added 'After Loading File - Sort By' option, which allows you to choose how to sort the file after loading it into CSVFileView - by original file order or by the first column. Added 'Automatic Column Size' option, which allows you to choose how to set the columns size after loading a file - Fixed Size (Default), By Column Values Only, or By Column Values+Headers. Added 'Open Recent File' menu (Under the File menu), which allows you to easily open the last 10 csv files that you have previously opened. If you use CSVFileView for loading large files, it's highly recommended that you try this mode and report about any bug/problem you discover. Added 'Advanced Open' option, which allows you to specify the delimiter and quotes characters of the file you want to load. This option is useful for files that their delimiter character is not detected correctly by CSVFileView. Added 'Allow MultiLine Fields' option. When it's turned on, CSVFileView will be able to load csv file containing field values with multiple lines. Added option to stop the loading process of csv file, by clicking the 'Stop' menu item, or by pressing the Esc key. Added 'Auto Refresh' option. When it's turned on, CSVFileView automatically reloads the file when a change in the size/modified time of the file is detected. When using the refresh option (F5), the lines are now sorted according to the last sorting you chose (by clicking the column headers). Added 'Unicode/Ascii Default Open Mode' option, which instructs CSVFileView how to open a file without a Unicode signature (byte order mark) - as Ascii (the default), as Unicode, or as UTF8. Added 'Automatic Date Sorting' option. Be aware that date sorting doesn't work with all date formats. Fixed the problem with negative numbers sorting. Fixed bug: CSVFileView didn't display all columns if the first line had one or more empty fields. Added /load command-line option, which allows you to specify the file to open from command-line. Added support for save command-line options (/shtml , /sxml, and so on), which can be used together with /load command-line option for converting the csv file into xml/html/tab-delimited file. Added 'Explorer Context Menu' option. When this option is enabled, 'Open With CSVFileView' menu item is added when you right click on a text file. Automatic delimiter detection - When CSVFileView cannot find a comma or tab character in the first line, it tries to automatically detect the right delimiter character and parse the file with it. Added support for loading UTF8 files. After running CSVFileView, you can open the desired CSV/Tab-Delimited file by using the 'Open CSV\Tab-Delimited File' option (Ctrl+O) or by dragging the file from Explorer into the main window of CSVFileView. If the first line of the CSV/Tab-Delimited file doesn't contain the column names, you should turn off the 'First Line Contains Column Names' option (Under the Options menu) before opening the file. Remove one or more columns or change their position by using the 'Choose Columns' window (F7). You can also change the position of the columns by dragging the column headers into another position. Select one or more lines, or select all lines (Ctrl+A), and then saving them into csv, comma-delimited, XML, or HTML file, by using the 'Save Selected Items' option (Ctrl+S). You can also press Ctrl+C to copy the selected lines into the clipboard, and then paste them into Excel. Unicode/Ascii Save Mode: By default, CSVFileView saves all files in Unicode, except of csv file, which is saved as Ascii. The reason for saving csv files as Ascii is... Microsoft Excel. That's because Microsoft Excel doesn't open properly csv files that are saved as Unicode. You can change the default behavior, by going to Options -> Unicode/Ascii Save Mode, and then choosing the desired save mode - Ascii or Unicode. Starting from version 2.30, there is a 'Quick Filter' feature that allows you to type one or more strings and instantly filter the file, showing only the lines contain the strings you typed. In order to activate and deactivate this feature, go to View -> Use Quick Filter or simply press Ctrl+Q. After this feature is activated, you can type the desired filtering string in the text-box located under the toolbar and CSVFileView will instantly filter the result. You can choose to filter by only one string, multiple strings (comma delimited), or multiple words (space delimited). You can also choose whether to scan all columns or only the visible columns. Starting from version 2.20, CSVFileView allows you to apply a filter for viewing only the lines you need. Display Filter window (F2): The Filter is applied after the entire file is already loaded. When using this option, you can easily remove the filter and view again all items by switching the 'Use Display Filter' option (Ctrl+F2) or you can press F2 again and use another filter. 'Advanced Open' window (Load Filter): The filter is applied while loading the file, so all lines that are filtered out by your filter are not loaded at all. If you filter out a lot of lines with the load filter, then the file will be loaded much faster and CSVFileView will consume less memory. Display only items the their Filename column contains 'abc' string or 'qwe' string. With CSVFileView, you can also open a log file of Apache or other Web server that generates a log file in the same format. In order to do that, you should turn off the 'First Line Contains Column Names' option, open the 'Advanced Open' window (Ctrl+Shirt+O), type \s (space character) in the delimiter field, and " in the quotes field. Choose the log file to open and then press Ok.
/load <Filename> Start CSVFileView with the specified csv/tab-delimited file. /aload <Filename> Start CSVFileView with the specified csv/tab-delimited file. The file will be loaded according to the 'Advanced Open' settings. /stext <Filename> Save the loaded csv/tab-delimited file into a regular text file. /stab <Filename> Save the loaded csv/tab-delimited file into a tab-delimited text file. /scomma <Filename> Save the loaded csv/tab-delimited file into a comma-delimited text file (csv). /stabular <Filename> Save the loaded csv/tab-delimited file into a tabular text file. /shtml <Filename> Save the loaded csv/tab-delimited file into HTML file (Horizontal). /sverhtml <Filename> Save the loaded csv/tab-delimited file into HTML file (Vertical). /sxml <Filename> Save the loaded csv/tab-delimited file into XML file. /scustom <Filename> Save the loaded csv/tab-delimited file into a custom delimited text file. /sjson <Filename> Save the loaded csv/tab-delimited file into a JSON file. /sort <column> This command-line option can be used with other save options for sorting by the desired column. The <column> parameter can specify the column index (0 for the first column, 1 for the second column, and so on) or the name of the column, like "Description" and "User Name". You can specify the '~' prefix character (e.g: "~Description") if you want to sort in descending order. You can put multiple /sort in the command-line if you want to sort by multiple columns. CSVFileView.exe /Load "c:\temp\1.csv" /shtml "c:\temp\1.html" /sort "~Value" /sort "Description"
A file named CSVFileView_lng.ini will be created in the folder of CSVFileView utility. After you finish the translation, Run CSVFileView, and all translated strings will be loaded from the language file. If you want to run CSVFileView without the translation, simply rename the language file, or move it to another folder. 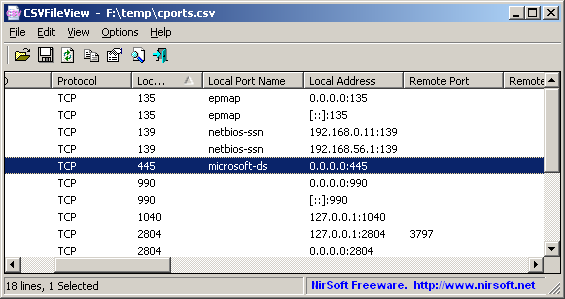 CSVFileView is also available in other languages. In order to change the language of CSVFileView, download the appropriate language zip file, extract the 'csvfileview_lng.ini', and put it in the same folder that you Installed CSVFileView utility.